Before its widespread use in concrete, most silica fume was land filled. Today, very little is land filled in the USA. 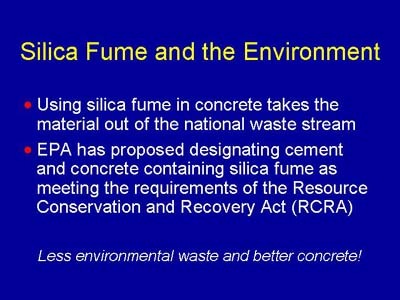 On August 28, 2001, the Environmental Protection Agency (EPA) published notice in the Federal Register (66 FR 45256) of its intention to add cement and concrete containing silica fume to the list of materials meeting the requirements for recycled materials under the auspices of the Resource Conservation and Recovery Act (RCRA). This proposed action is currently open for public comment. If approved as proposed, silica fume will join fly ash and ground granulated blast furnace slag in the category of concrete materials covered by RCRA.